Mary and I have collected 10 easy landscaping ideas from our travels photographing front porches across the U.S. to share with you. Most importantly, they are fun to do and will help you create lots of curb appeal for your front porch and home. 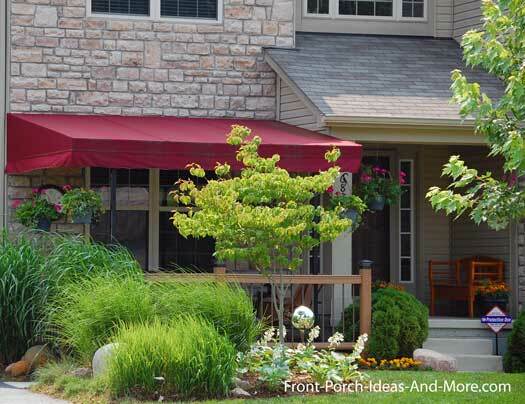 They are ideal for both large and small porches. 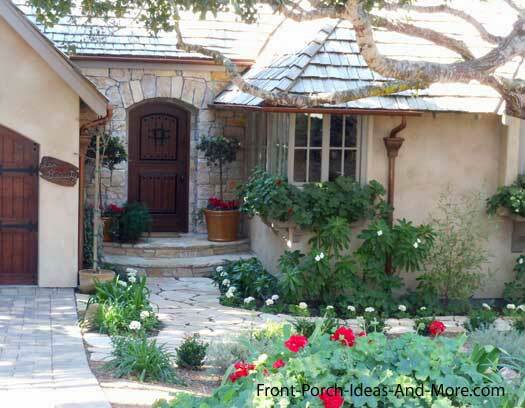 In fact, many of our ideas can have a dramatic affect in creating extra charm and appeal on small porches or porticos. No matter the size of your front porch, the right landscaping adds intrinsic value to any home. Although a few may take a little time to do, and others may take time to see the final results (plant growth time), our 10 easy landscaping ideas are sure to give your front yard and porch a nice new look. Use large planting containers on your front porch with bold and colorful plants to make a huge impression. An added bonus is that large containers retain more water than smaller ones - meaning less work. To make your work even easier, you can obtain self-watering planters like those pictured above. These are perfect for those who want lovely looking plants but find it difficult to maintain them if away from home for extended periods. Create curb appealing and eye-catching landscape displays near your front porch by using plants with differing shapes, colors, and textures, and even leaf patterns. 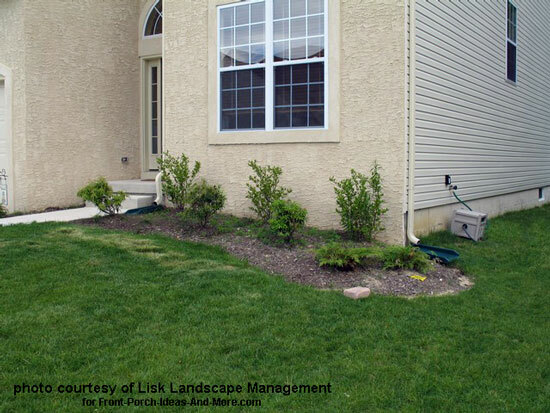 Continue your pattern onto other areas of your front yard for continuity. 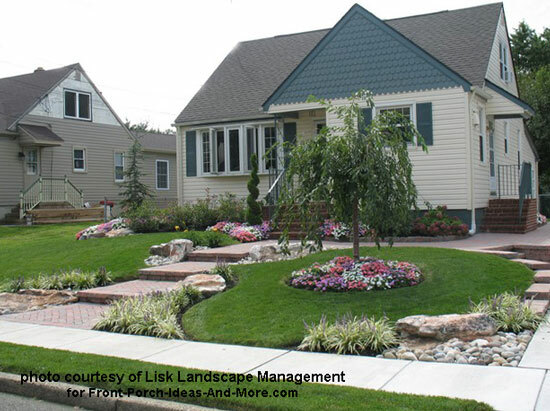 Minimize your work by planting low maintenance foliage. By using a combination of grasses and herbs, you cut down on watering and you'll only need to do a little periodic pruning. 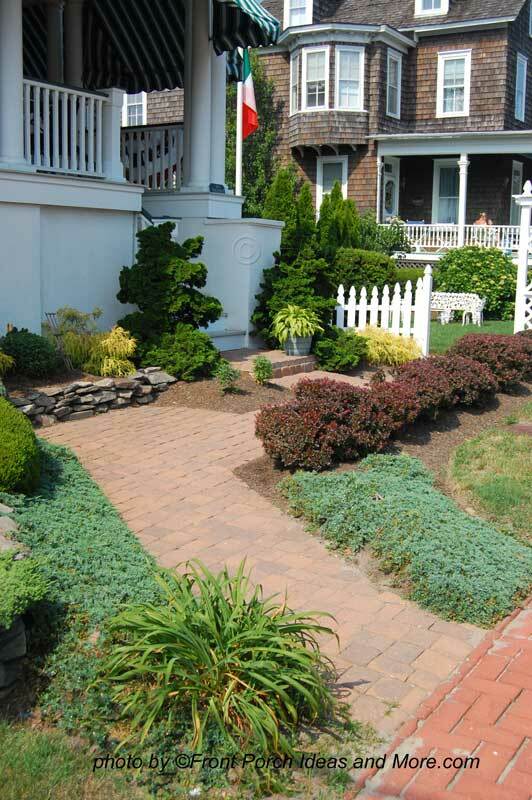 Use a combination of plants and pavers to extend the look of a small porch or portico. Small entrances can be visually enlarged by creating a patio area either in front of or beside the front door. Add either in-ground plants or a combination of large and small planting containers to finish the look. Have a very small front yard? Expand your planting bed leaving only a short expanse of grass creating a more colorful and curb appealing array of foliage. 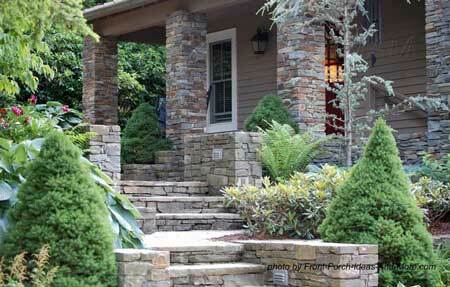 Expand or integrate your planting borders to create a walkway to the front porch. If feasible, include aromatic plants so your visitors can enjoy the journey from the street to your home. 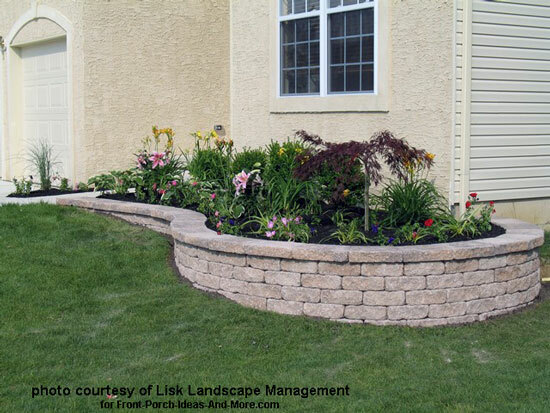 This also works well for establishing walk ways to the sides of your home. 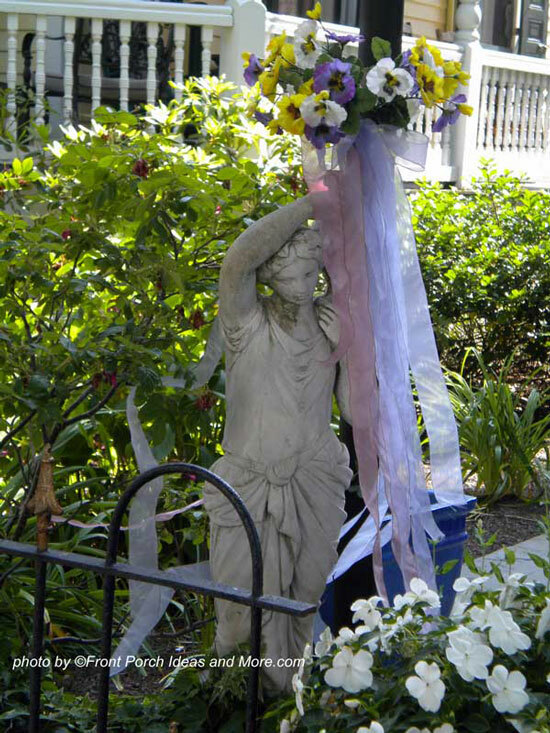 Integrate artwork, like sculptures or statues, into your landscaping to create a focal point and add lots of interest. This is a really easy landscaping idea because you can use items from around your home with which to decorate. 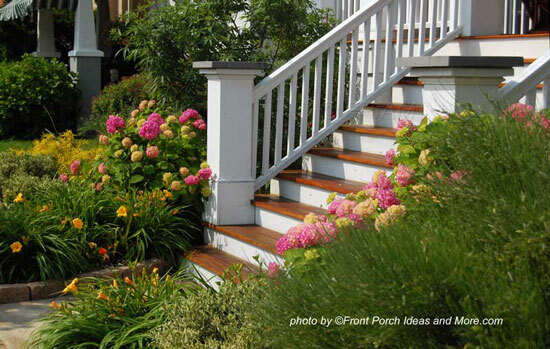 Consider using low maintenance and easy growing foliage for slopes near your porch. 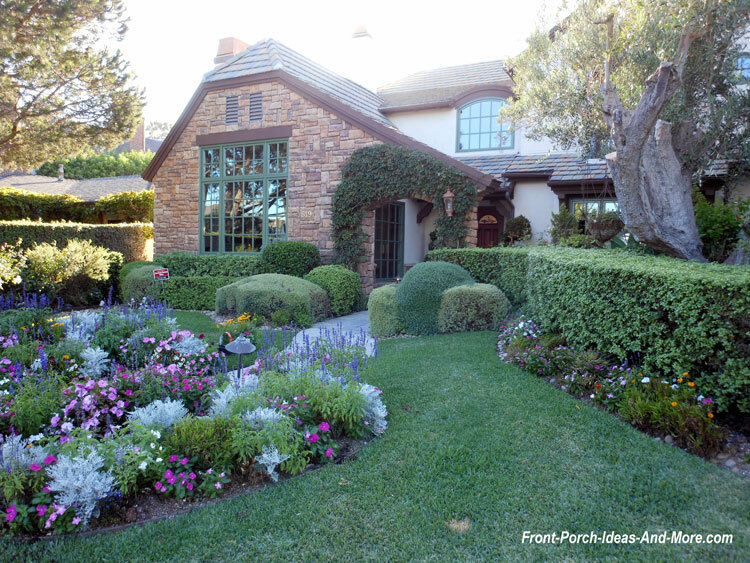 Evergreens, ferns, and grasses make it easy to maintain and create a beauty all their own. 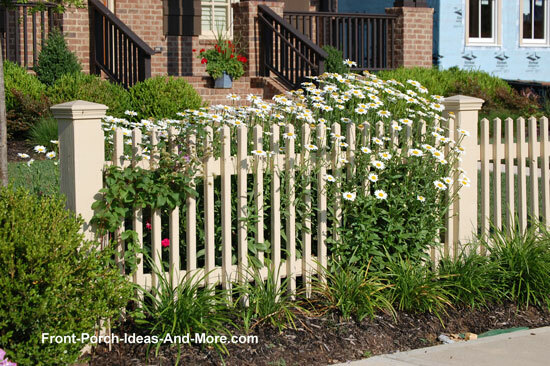 One of our favorite easy landscaping ideas - we like picket fences. Use a backdrop like a partial picket fence with which to plant against. This works well at the corners of your yard or at the ends of your porch or home. You need not have to install a lot of picket fence. Quite the contrary, you only need about 8-10 feet. Sidewalks have appeal especially if they warrant a second look. Avoid making them straight; a curved sidewalk has an appeal all on its own. Use pavers, brick, flagstone, or a combination of materials to make it interesting. They also give you more areas beside which you can decorate with foliage. 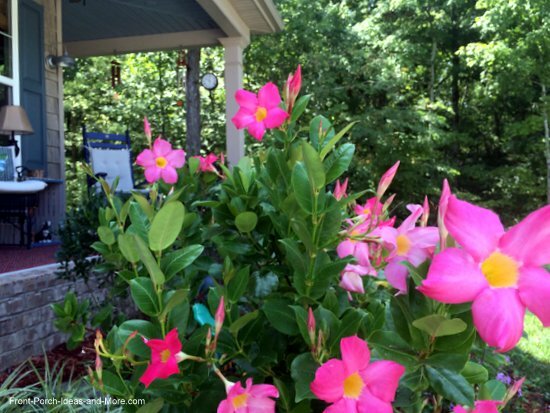 Mary and I hope you enjoyed these 10 easy landscaping ideas. 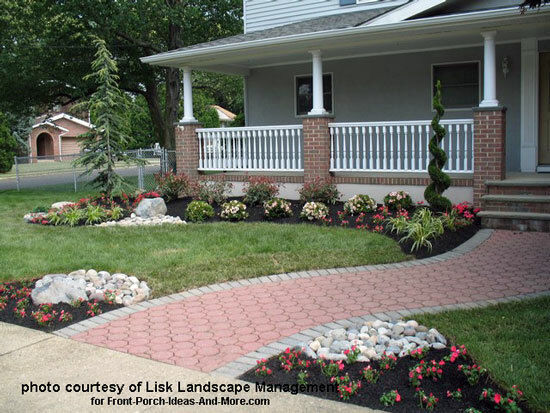 Our landscaping pages are filled with even more ideas and beautiful landscaping pictures to give you myriads of ideas for your front yard and porch. Coordinate the colors of your flowers to coordinate with the colors of your home. Our home has blue shutters and a blue front door. These flowers "pop" against the colors of our home. 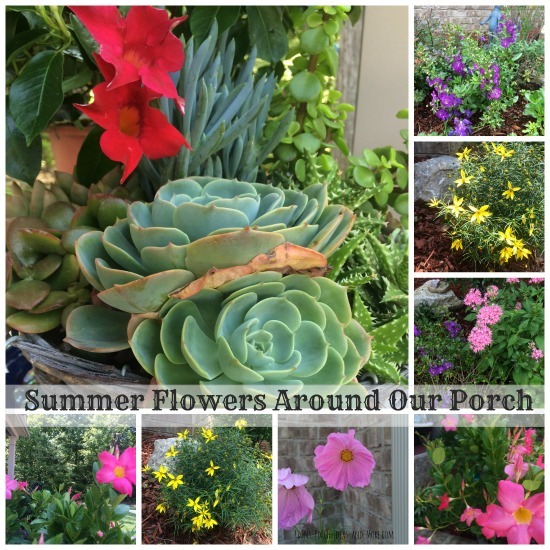 A collage of the flowers planted around our front porch; they all complement our home nicely. Just as the sky reflects the ocean, so should your landscaping reflect the colors and style of your home.